Microsoft will release the much anticipated Zune portable multi-media player on 14th November 2006 in US market at the price of $249.99. Zune is a brand from Microsoft that incorporates a line of portable media players, software that will run the devices, and an online service for acquiring and sharing media. The pricing of Zune portable media player which features 30GB hard-disk based storage is about the same with 30 GB and 2.5-inch screen Apple iPod. 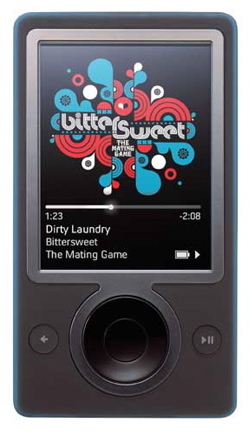 However, Zune player will also have a few features that Apple iPod lacks, notably built-in FM tuner with Radio Data System, 802.11 wireless networking between Zune players that allows limited sharing of songs for up to 3 days or 3 plays, and pre-loaded music and videos that are included. Zune has a 3.0-inch color screen, and will available in three colors, i.e black, brown and white, at launch. Zune Marketplace music store meanwhile will sell music and songs at about 99 US cents or 79 Microsoft Points per track. Zune Marketplace uses Microsoft Points as currency, the same currency that used on Xbox Live, where user buy 80 Microsoft points for $1 US dollar. Another option that lack in Apple iTunes Music Store is that Zune marketplace also offers music subscription pass named Zune Pass for $14.99 a month for an unlimited access to songs and music on Zune Marketplace. Apple iTunes Music Store does not offer any subscription service or music renting feature. New digital rights management (DRM) system will be used to protect content on the Zune system, and the Zune does not support Microsoft PlaysForSure or other DRM systems such as FairPlay. Zune Car Pack ($79.99) includes the built-in FM tuner with AutoSeek and a Zune Car Charger. Zune Home A/V Pack ($99.99) which is designed to inter-operate Zune with the TV and music speakers, includes a Zune AV Output Cable, Zune Dock, Zune Sync Cable, Zune AC Adapter and the Zune Wireless Remote for Zune Dock. Zune Travel Pack ($99.99) which focuses on mobile entertainment includes the Zune Premium Earphones, Zune Dual Connect Remote, Zune Gear Bag, Zune Sync Cable and the Zune AC Adapter. If you want to buy the Zune accessory separately, Zune AV Output Cable and Zune Sync Cable will be priced at $19.99, Zune AC adapter, Zune Wireless Remote, Zune Gear Bag and Zune Dual-Connect Remote with dual headphones at $29.99, while Zune Dock and Zune Premium Headphone will be sold at $39.99.